Easily compare census data for New Jersey and the rest of the United States with this great free tool funded by the Knight Foundation. Labor Market Information Economic and population data for New Jersey. This is the best site to start your search. Economic Indicators. This is the online version of the NJ Dept of Labor’s Economic Indicators periodical which contains a variety of statewide economic data. Census Data and American Community Survey US Census data for NJ. Housing Sales This webpage of the New Jersey Association of Realtors provides information on New Jersey home sales for 2001-2010. Labor Force Estimates This page links to “Annual municipal labor force estimates,” “Annual & Monthly unadjusted county labor force estimates” since 1976 and several other estimates. CSH Homeless population data arranged by county. AMA Doctor Finder Provides information on licensed physicians in the United States. Forums Institute for Public Policy Issue briefs developed for a series of nonpartisan policy forums about health care in New Jersey. Health Statistics Health statistics from the Department of Health and Senior Services. MSNJ Physician Finder Provides information on individual physician-members of the Medical Society of New Jersey. New Jersey Health Care Profile Information presented by the Division of Consumer Affairs about New Jersey medical doctors, optometrists and podiatrists. The profiles provide information about practitioners’ credentials and education and also about disciplinary actions, hospital restrictions and malpractice payments made within the past five years. New Jersey Self-Help Group Clearinghouse Provides contacts for over 4,500 local self-help groups in New Jersey. Also helps those in New Jersey interested in joining with others to start new self-help groups. Online Licensee Directory Directory of professionals licensed in New Jersey. You can search for medical licensees such as physicians assistants, dentists and licensed practical nurses. NJ.com This website contains articles from the [Newark] Star-Ledger, The [Trenton] Times and many other newspapers, as well as archived stories. 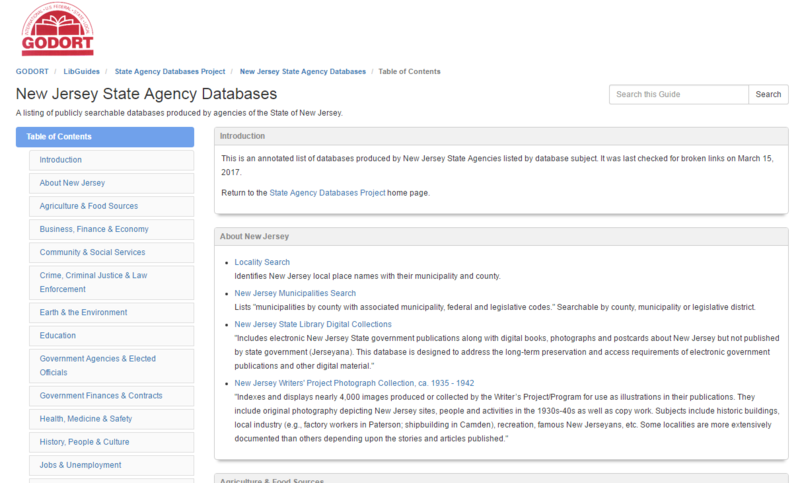 For other newspapers online, see the New Jersey Newspapers web page or the Newspapers Databases web page. New Jersey Monthly The web site for the popular NJ magazine, includes dining information and an archives. The September issue usually has a feature article on schools in NJ. New Jersey Business The website for the NJ Business and Industry Association’s magazine, New Jersey Business. Selected articles from the current issue; no archives. New Jersey Radio Stations Arranged by format (talk, country, alternative etc.). Includes stations originating in New Jersey but not stations heard in NJ from PA and NY. Earthquake Info A listing of earthquakes in the Northeastern U.S.
New Jersey Geological Survey’s home page Includes a geologic map of New Jersey. U.S. Geological Survey Programs in New Jersey This homepage for the USGS New Jersey District links to daily Current Streamflow Data and both annual and monthly Hydrologic Conditions. The Newark Public Library's online collection contains a selection of photographs, newspapers, and other documents from the collections of the Charles F. Cummings New Jersey Information Center and the New Jersey Hispanic Research Information Center at The Newark Public Library.